Well it seems like the guys at AndroidSpin has got their hands on a leaked image for T-Mobile’s handset line up for the remainder of the year. Now it is possible that this could be fake, but since the Motorola Charm was just announced and it’s listed in the line up it just might not be. According to the image a Dell netbook should be coming out between July & August. 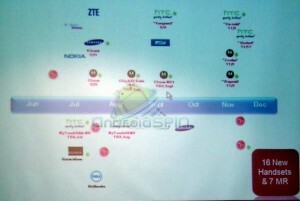 And the HTC Vanguard, which is due out in September, their is not a lot of information about the handset. There’s also an update going out to the Mytouch 3G,CLIQ & CLIQXT in August.